I gave up making New Year's Resolutions a while back because I never seemed to keep any. But recently, I resolved to try to improve my prayer life and with God's grace in this Year of Faith, I have been able to converse with Him more often, more deeply and more regularly! So I wanted to share some ideas that have worked to create this (and other) holy habits. The most important thing about a new habit is to start small and make it doable. It might be a wonderful idea to start making a holy hour of prayer every day, but how many of us can add an extra hour into our crazy, busy lives? But if that is our goal, we can get there if we start with baby steps. Starting off with 5 minutes a day, at an established time and building the habit we can do wonders! What will the habit be? and when will this habit happen? 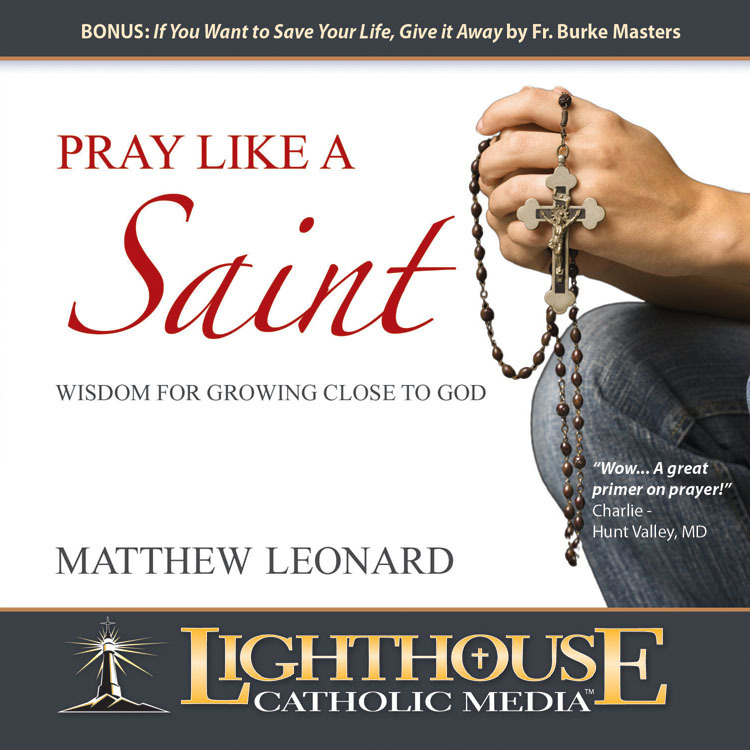 Here are some ideas on new prayer habits, along with an idea on when you can do them. These are practical, tested ideas that can work. Read through the list, ask God to show you ONE that is for you. Tweak it in any way and Own It. What: Morning Prayers When: in the car on your way to work or school, with or without the kids. We pray the morning offering each day as soon as we get in the car. We have also been adding a new prayer or scripture each month to increase memorization. Just keep a written copy in the front seat to read/pray until you memorize it. You can also say it into the Voice Memo on your phone and listen to it. (CLICK HERE for ideas for a prayer for each month) Bonus for those with kids in the car: it removes the usual arguing among the siblings! 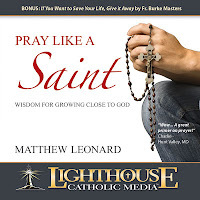 Decide whether you will say an extemporaneous prayer or a traditional prayer ("Bless us O Lord and these thy gifts which we are about to receive, from thy bounty, though Christ, Our Lord, Amen") and then don't even pick up a bite of food until you pray. What: Evening Prayer, especially Family Rosary When: before bed This can be really hard with many children and activities. The only way to make it happen is to ask for God's grace, set a time and "just do it." The family that prays together stays together as Fr. Peyton rightly quipped. Start with a short prayer and get it down regularly. Then reach for a longer prayer like the rosary. Daily mass is a great holy habit. 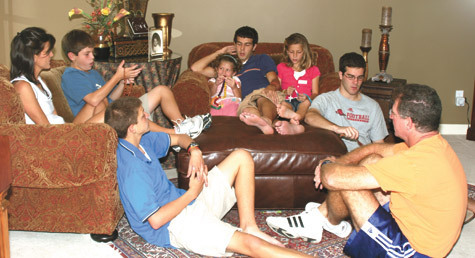 Not only is the mass the source and summit of our faith, it is at a fixed time, that you can build in to your day/week. To begin this habit, just add ONE daily mass a week (like every Friday) Daily masses are only 30 minutes. Make it a non-negotiable, just like a business appointment, earlier in the day the better. Put it on all the Fridays (or whatever day works for you) on your calendar and book other things around it. When you get to lent, add a second or third day per week! What: Personal Prayer time and going deeper in Scripture When: Before anyone else is awake, or after they've all gone to sleep. Earlier is always better. Start with just 5 minutes. Call upon the Holy Spirit to enlighten your mind. Start with one of the gospels and read just a few verses. Ponder them, chew on them, visualize them. Re-read them. Ask God to reveal to you something about Himself. Praise Him, Thank Him, present any needs to Him. Say one Our Father and stop. Keep it at 5 minutes every day for at least a month before you try to pray longer. What: Read more Scripture, more often When: Every time I have to wait: in car line at school pick up, at doctor appointments, long lines in stores-any waiting time. I recently found an iphone app that makes this so easy, the Lighthouse Catholic Media Bible app powered by Truth and Life. 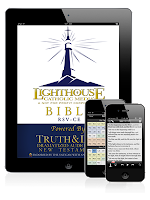 Every book of the bible is available to read for free and the gospel of St. John is also available dramatically read in audio. (The audio for the other books of the bible can be purchased.) Your phone is always with you, right? So don't get angry next time you have to wait, read scripture! Enter promo code 8846 for a free talk! What: Singing When: Anytime, anyplace To sing is to pray twice, so why not keep a song in your heart all the time. Spirit FM 90.5 FM Tampa (or online at www.spiritfm905.com )is a great radio station to tune into. 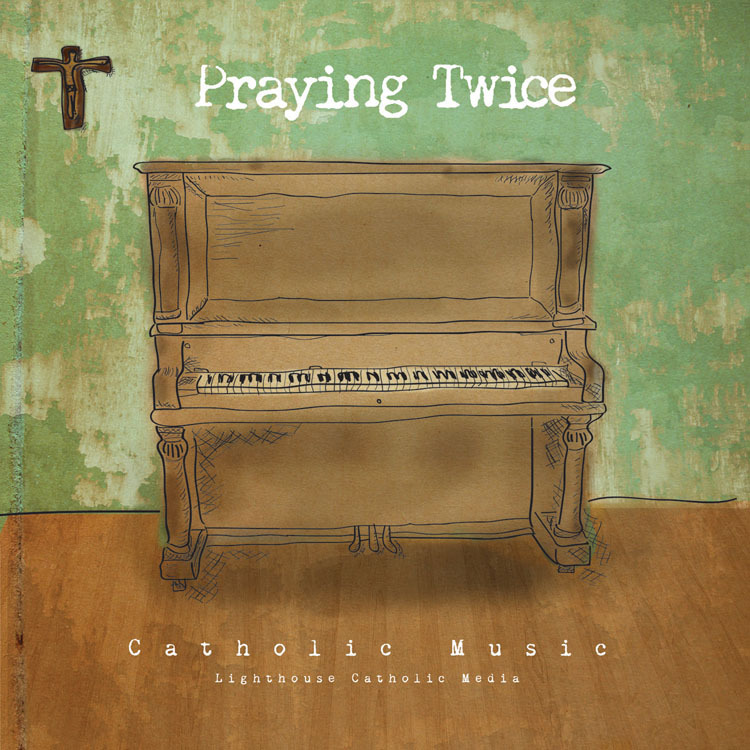 Just hook one song in your head at the beginning of the day, and you are praying all day long as you hum it, sing it, tap it, and pray it. 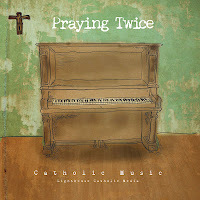 A great CD to keep with you is Praying Twice. CLICK HERE to get a copy. A better prayer life just won't happen because I wish it to happen. I have to plan times and set reminders until it becomes habit! Starting small and getting into a regular habit is the only way. Remember, just pick ONE thing to start with. All of the ideas above are to give you options to find something that will work for you and your family, right now. St Paul says pray without ceasing! Pope Benedict has called us to a Year of Faith. Let's dive into it, improve our prayer life and learn our faith better, love it more and share it with others! Happy New Year and God Bless you in 2013. 1. To make my Christmas a holy day with Christ-----not a holiday without Him. 2. To observe Christmas as the birthday of Christ-----not to give and receive material gifts. 3. To remember that the real symbols of Christmas are the Star, the Stable and the Crib-----not Santa Claus and his reindeer. 4. 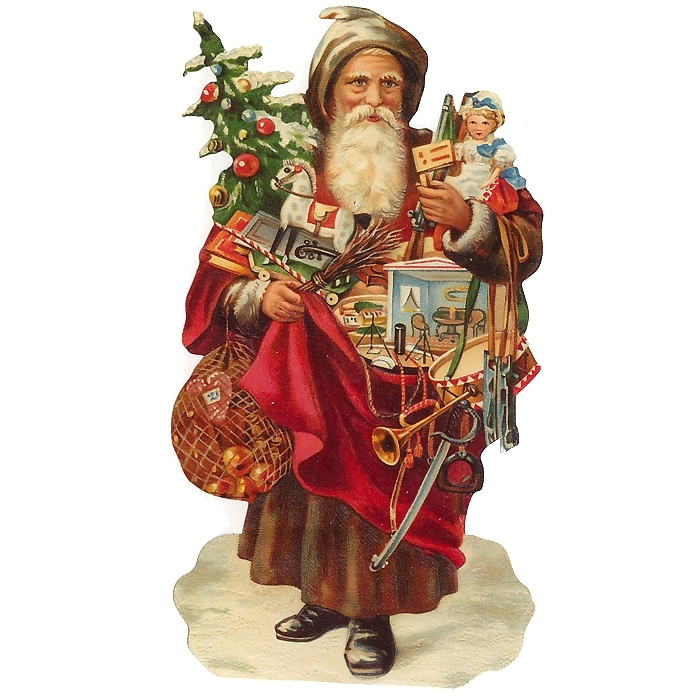 To teach my children that "Santa Claus" is the nickname of St. Nicholas-----who gave to the poor in honor of Christ. 5. To help one poor family-----in honor of Jesus, Mary and Joseph, the Holy Family of Bethlehem. 6. To send Christmas cards mindful of Him, the Infant Savior-----not decorated only with candy canes, dogs, ribbons, and wreaths. 7. To make room in my home for Him-----with a Christmas Crib to remind me that He was born in a stable. 8. During the Christmas season, in a special way, to honor Mary, His mother-----who kept the first Christmas vigil beside the manger. 9. To begin Christmas by leading my family to His altar-----to receive the Bread of Life. 10. Today and every day, to give "Glory to God in the highest"-----to work and pray for "Peace on earth, to men of good will." Come to me, O Divine Savior, vouchsafe to be born in my heart. Grant that, taught by Thine example, and assisted by Thy grace, I may be poor in spirit and humble of heart. Keep me chaste and obedient. I wish to live but for Thee, and to do all things purely for love of Thee. O Mary, my Advocate and Mother, obtain by thy prayers forgiveness of my past offenses and holy perseverance unto death. St. Joseph, do thou also pray for me, that I may become daily more pleasing to Jesus. Amen. of profound desire to do his will, of joyous service to our neighbor. extend a part of his kingdom of love, of justice and of peace." Have you already missed Black Friday and Cyber Monday? Are you stressed about gift giving? Three Gifts, Christmas Date Night, Santa Doesn't Wrap, Religious Gift and Extra Gift Cards. A great rule of thumb my parents used when we were young was Three Gifts each. Their reasoning was that the Christ Child received three gifts of Gold, Frankincense and Myrrh, so three must be a good number. We don't always use the Three Gift rule with our kids, due to pricing of some big items, they may only get one or two. But use this rule of Three Gifts to curtail costs and keep it simple. When all the kids were under 10, Bob and I would do all the Christmas shopping in one evening. It was our Christmas date night. We would have one of the grandmas watch the kids (sleepover is best) and we would have a nice dinner out and then go to a MAJOR toy store. We always took this list with us when we went shopping in hopes of making each one's Christmas dreams come true and also to keep us from throwing in impulse items or getting more gifts for one child than another. To make a list, we used the ad flyers for major toy stores that come in the mail in early December. We always gave these to the kids and let them circle any and all the toys they wanted. We always told them that Santa needed ideas and that he could never bring all the items they wanted, but would bring some of them. This became our working list. Another list to have with you is a list of things the children already have. Home many times do you go to buy a new train for the Brio set and can't remember if you have Thomas and James or Thomas and Henry? If I don't write down Little Pet shop beauty shop, I can easily think she has Little Pet Shop hospital. Write down what you have so you don't duplicate. As the children have grown up and no longer want kiddie toys, the gift giving gets trickier. One thing that is always great is a family gift, that everyone can enjoy. Some ideas could be foos-ball table, ping pong table/pool table, basket ball hoop, kayak/paddle board. At our house, Santa doesn't wrap. This was always the tradition in Bob's family growing up. When our kids were little, all the gifts were from Santa. And Santa doesn't wrap, he displays the gifts. One child's gifts are on the sofa, another child's gifts are on the chair. Not wrapping saves so much time and money and waste. Also, a time or two, it allowed us to switch a gift from one child to another after everything was laid out the night before to make it all look pretty equal. One thing we always try to do, not only for our own children but for gifts for our god-children too, is to give a religious gift. Depending on age, it could be a bible, a crucifix, a rosary, a prayer book or devotional book, a picture of a saint or holy hero or just a prayer card and a prayer. A Truth Be Told Download of the Month Club subscription is a great gift to inspire teens, click HERE to JOIN. The last several years, we have bought the restaurant gift cards that give a discount or a bonus card for after the holidays. We usually buy extra of these, for people we might forget. I recommend getting some $5 and $10 cards and keeping them with you. Extra Gift Cards, come in really handy not only for someone you forgot, but also for someone that comes to mind spur of the moment: school personnel, hairdresser, postman, AND for Kris Kringle gifts that your kids remember as you are driving to school in the morning! And if you don't give them away at Christmas, they are great to give to a mom with a new baby so she does not have to cook a meal any time of year!